I have nothing against delivery, not all. Especially food delivery. I don’t utilize it that much, but if others do more power to them. What I do have a problem with is Amazon getting its clammy tendrils in yet another industry. 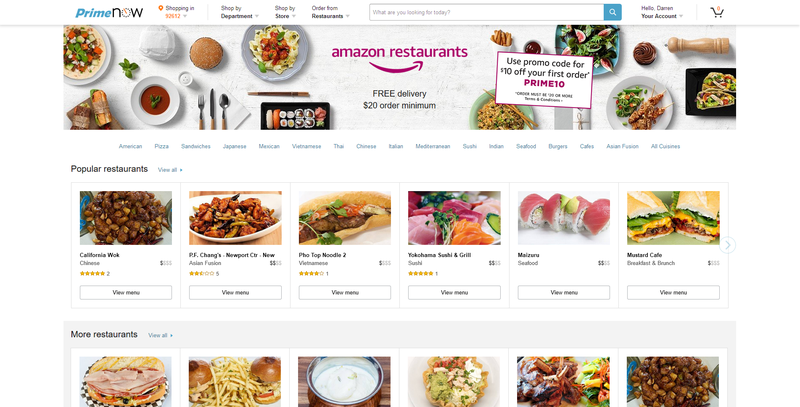 I received an email letting me know that somehow Amazon has partnered up with local restaurants to deliver food to my house, and the link took me to the page you see in the title image. To borrow the headline from my previous post, “Why Not,” right? For me, it’s because I have a great fear of Amazon simply taking over everything to the point where we’ll never need to leave our house again. We already worry about immobility, isolation, lack of exercise, conversations using technology instead of speaking face to face, etc., and Amazon’s ability to cater to your needs plays a large role in much of that. They can deliver everything we need, so why do we need local stores, or malls, or movie theaters, and now restaurants? We’ll no longer need to go outside because Amazon will just deliver everything straight to our door. Need shoes? Shampoo? A movie? New SD card? Guitar Strings? Ken doll? Oil filter? Even groceries or gourmet food? Don’t leave the house! Order from Amazon! Never mind local shoe stores, drug stores, theaters, tech retailers, music stores etc. will wither and die under the might of Amazon, something we’ve already seen with Border’s, and that’s only one. I should also add that I am very aware technology can help with much of those issues as well. In fact, if you’re going to be home anyway, order exercise equipment, a protein shake and pedometer from Amazon! Back to restaurant delivery. If restaurants want to offer a delivery service, I’m all for it, although I prefer to actually go to the restaurant, or at least do carry out. It’s nice to stand up from my chair every once in a while. Even after the rant in the previous paragraph, I should add that I use Aamzon. They have good prices and and an almost limitless selection; the WalMart of online retailers. And therein lies the concern: just as WalMart has been responsible for the death of numerous local businesses, so it goes with Amazon as seen in both the previously linked article. Again, I use Amazon occasionally and have nothing against the idea of eCommerce. I will, however leave you with this image from Wall-e, and hope it never comes to pass, no matter how much Amazon tries to ensure it does.